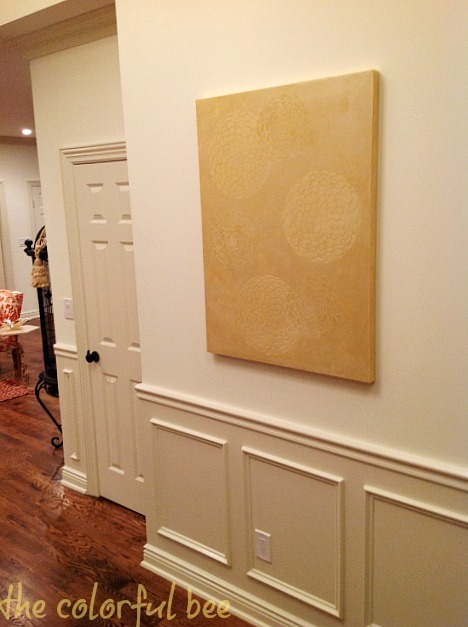 I did several pieces for this home but on this post I will show you how I created the raised stencil art that would be the first thing that a potential buyer would see when they opened the front door. Cups for mixing plaster etc. Paint your canvas in a color that is closest to your final color. I used an off white latex paint but for best results, use a closer color. Mix the Mustardseed plaster with about 20% water and then roll that haphazardly on your canvas (not just straight up and down). Let dry. 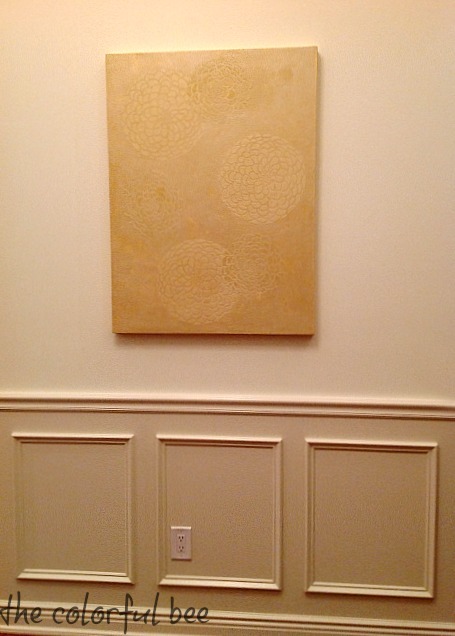 With a trowel, apply the Mustardseed plaster, full strength, on the canvas – cover about 90%. Leave a few smaller areas bare, so that your final layer of plaster will have something to settle into. Try to apply smoothly, but if you have trouble with this – don’t worry! You can sand down any raised areas with your sanding block. Let dry. 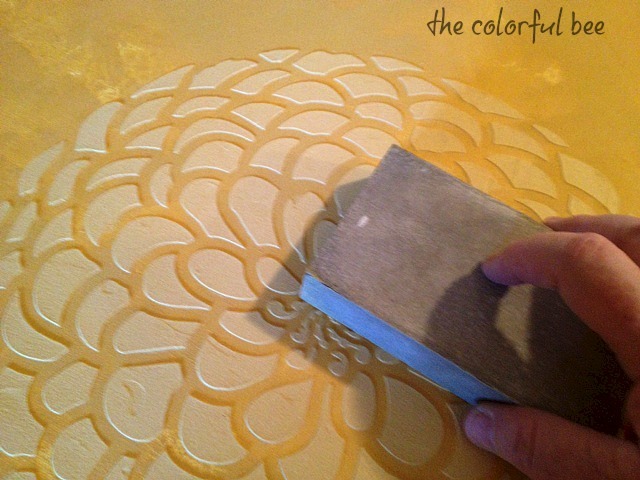 Assemble your stencils, trowel and stencil adhesive spray. Try different stencil arrangements. I like a composition that seems natural and flowing. 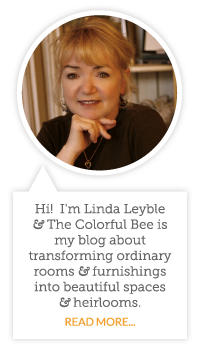 I did two overlapping stencils – and I used three different sizes. 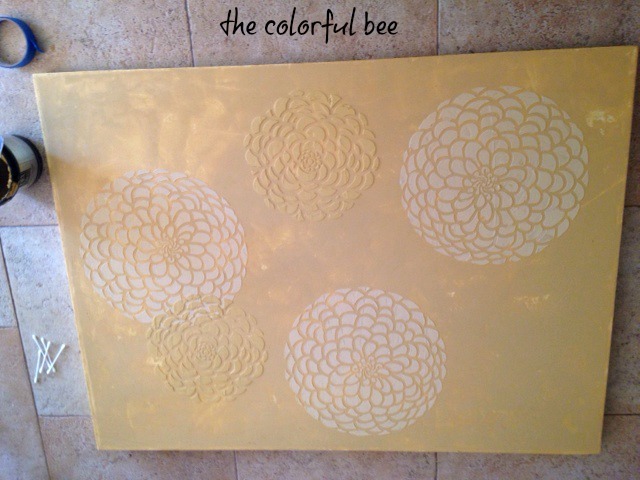 The stencils I used were from Cutting Edge (Zinnia Grande) and Royal Design Studio (Bloomers Zinnia Flower stencil set). 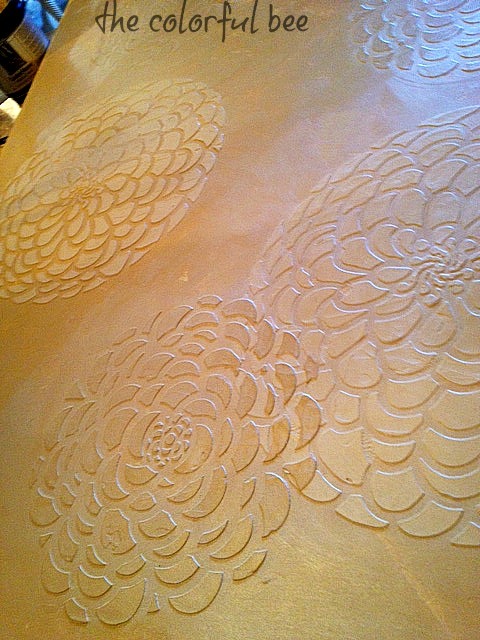 Lightly spray the back of your stencil with stencil adhesive and place it on the canvas. Scoop out a small amount of full strength metallic plaster (I used Mustardseed for the larger stencils and Tinting Base for the smaller stencils) and trowel the plaster through the stencil. Trowel on (lightly for low relief; build up another layer for a higher relief) but make sure your material goes into all the design areas. Tip: Try to hold your trowel almost parallel to the surface. A good idea is to do some practice first before attempting it on your canvas. If you do make some mistakes (material seeping through in unwanted areas), you can clean it up with a Q-Tip. 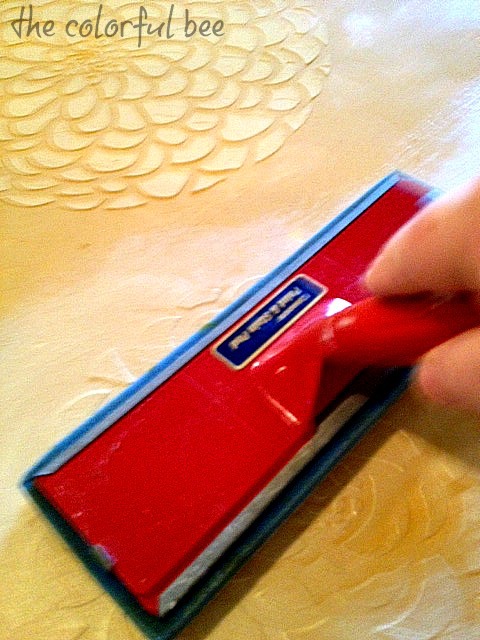 Hard or uneven areas can be sanded down after drying. Once you have trowel on all your designs and they are dry – you can sand down any areas that seem too high or areas that have trowel marks. Now for the final layer. Mix up a lighter colored plaster (I used Mustardseed + Tinting Base). I mixed about 50/50 but I added a little extra Tinting Base to lighten more. Then add some glaze or extender (about 20%) to this mixture. 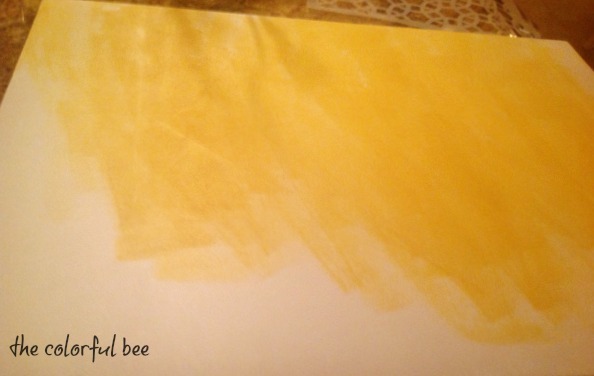 Start in one area of the canvas and put the mixture on with a brush – then use a paint pad to distribute. If you put it on too heavy – you can remove some of the build up with a terry rag. You can also take a Scot towel and remove some of the mixture from the paint pad – and go over the area to remove. The aim is to blend all the layers together. I also took a small piece of paper towel and removed some of the mixture from some of the petals. It’s all according to what you like – so there are no mistakes! It takes some time to do this – so don’t rush (unless you’re like me and have to use the hairdryer in between each layer to hurry it up!). But, it’s worth the time and effort because it’s unique and no one would know it’s a DIY project. 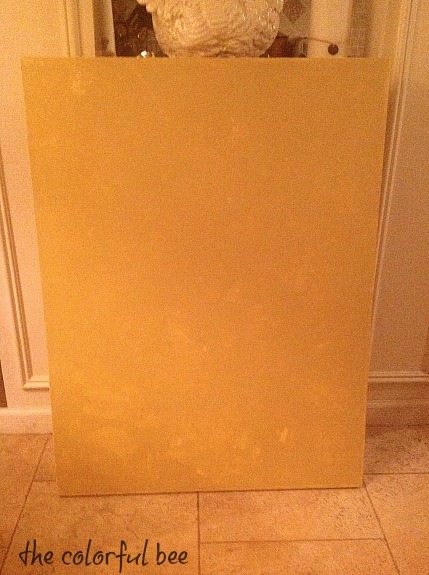 This entry was posted in Decorative Finishes, Home Staging, interior design, Makeovers, Paint, Tutorials and tagged art for home staging, creating original artwork, Cutting Edge stencils, DIY artwork, embedded plaster art, metallic plaster, plaster artwork, riased stencil art, Royal Design Studio. Bookmark the permalink. Thanks so much Sue for putting this on Pinterest! So, you will have to tell me if you decide to try it out! I think this looks lovely! Thanks for sharing!! Linda that is absolutely beautiful. Thanks for the idea. You are so talented. Thanks Mary! I had fun doing it…and it’s really not that hard to do. Time consuming, yes! But worth the effort! This is such a great idea! Beautiful.. Thanks Jessica! It was such a fun project to do! Love, love, love this. Very creative and original. I’m toying around with putting something like this on a wall instead of canvas. Thought maybe an oak tree on the wall going up the staircase with my husband’s and my initials (heart) “carved” into the relief. Hi Pam…what a great idea! If you do it, please send pics. Would love to blog about it.